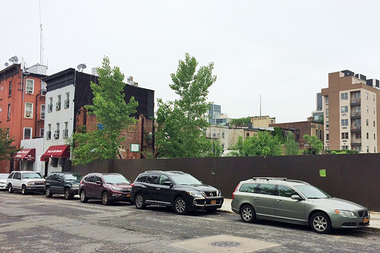 Pratt Institute is planning to build a new 10-story dorm at 135 Emerson Place. CLINTON HILL — Pratt Institute is planning to build a new 10-story dormitory a block from its Clinton Hill campus. The school is looking to build the 124-unit dorm at 135 Emerson Place, between Myrtle and Willoughby avenues, according to plans filed with the city’s Department of Buildings Thursday. The new dorm will cover 56,943 square feet and rise 118 feet, according to DOB records. The architect on the project is Cannon Design, records show. A spokeswoman for Pratt said the new building will replace an older, 190-unit dorm. "Like so many New York City based institutions, Pratt is planning for an anticipated shift in the affordable housing stock compounded with continued enrollment growth," the spokeswoman said in an email. The new residence hall will include a mix of living, academic and social spaces, the spokeswoman said. There will also be a variety of student lounge spaces, including one for first-year students, a convenience store and bike storage. Construction on the new dorm will begin this summer and is slated to be completed by fall 2017, according to Pratt. The property is zoned for nearly 97,000 square feet of residential space, meaning the new building will only use more than half of its buildable square footage, according to The Real Deal, who first reported the news. Pratt bought the property for $13 million in 2012 from Cara Development, which had planned to build a 16-story residential building with developer Hudson Companies back in 2008 before the recession led them to abandon the project, The Real Deal reported. The lot has been vacant since 2006 following the demolition of the 1930s-era M.H. Renken Dairy processing facility, according to the Myrtle Avenue Brooklyn Partnership.